I hope that the majority of my 365 screenshots will reflect the fun and adventures I’m having in game that day. However, as I hold out hope that this will be the Year of Horizontal Progression, I thought I would start with a snapshot of where I am with some of my achievements. I want to be able to look back at this post in 12 months time and see how far I’ve come, whilst having all my fun and adventures. Not everything can be reflected in one screenshot, so just to add to the record at the start of this project, I wanted to note the following. I currently have 15 character slots occupied; 7 level 80’s and a level 56 Ranger representing one of every profession and an additional 7 low level characters awaiting levelling. In total there are 10 female characters and 5 male and one of each armour class in each race. 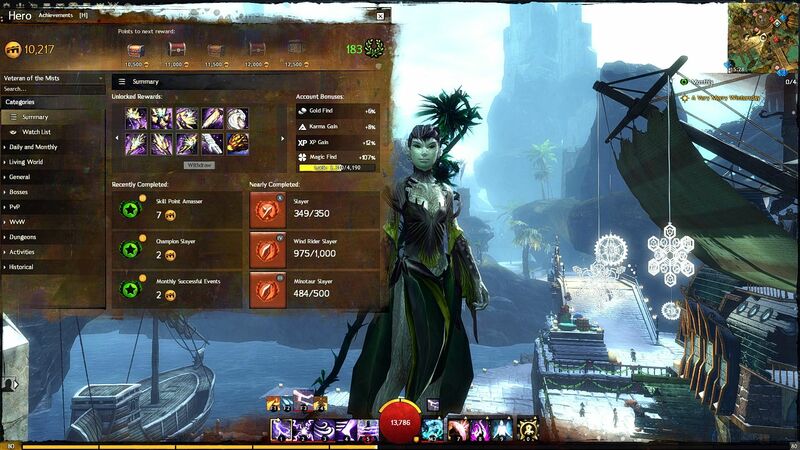 My fractal level is 23, my WvW rank on my main is 64 and my PvP level is 3 (!) Achievement points stand at 10,217 and Magic Find at 107% (101 from luck, 6 from AP). I need 3 dungeon paths for my Dungeon Master title; Aetherblade path in TA and paths 1 and 4 in Arah. I have crafted one legendary – Incinerator – and am working on a second, as yet undecided. Bring it on 2014 – I am not afraid!